Stephen Hawking's final paper, which aims to test a theory that proposes parallel universes, appeared today (May 2) in the Journal of High Energy Physics. 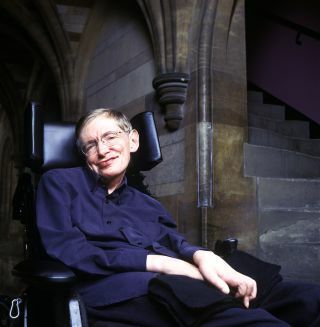 As Live Science reported at length in March, before the paper was peer-reviewed and officially published, it shares Hawking's final look at one of his earliest theories, the so-called "no-boundary proposal." This idea describes the conditions in the very early universe. Hawking and his co-author, Thomas Hertog, a physicist at the Catholic University of Leuven in Belgium, attempted to resolve thorny questions regarding the multiverse, or the idea that many universes exist side by side. Hertog called their conclusions a "departure" from the "no-boundary proposal" as Hawking originally presented it. "Hawking was not satisfied with this state of affairs," Hertog told Live Science in March. "'Let's try to tame the multiverse,' he told me a year ago. So, we set out to develop a method to transform the idea of a multiverse into a coherent, testable scientific framework." Hawking's final paper suggests a framework for understanding the universe that would render the multiverse finite, countable and subject to meaningfully engagement via the tools of science. There were some minor tweaks to the text of the paper as it appeared on the preprint server arXiv at the time of Hawking's death and its final published form, but they're minor and don't represent any fundamental differences in meaning. "There are no significant changes between versions 2 and 3," Hertog wrote in an email. "The paper represents indeed a departure from the no-boundary theory (as we write at the end)." Physicists that Live Science interviewed previously said that while the idea is interesting, it isn't earth-shattering — in part because there's still no good way to prove it's true. In addition, as North Carolina State University cosmologist Katie Mack told Live Science at the time, the idea is not yet fully fleshed out. To get to that point, Mack said, physics will need to overcome some significant hurdles. Most importantly, they have to develop a thorough unification of the theories of gravity and quantum mechanics. A PDF of the final, peer-reviewed version Hawking's final paper is available without a paywall on the preprint server arXiv. A digital version appeared on the journal's website on April 27.